Jacob Kramer (1892-1962) was born in the small town of Klintsy in 1892, then part of the Russian Empire, into an artistic middle class Jewish family. His father, Max, was a painter who had studied at the St Petersburg Fine Art Academy under Ilya Repin, and had become a court painter to Baron Ginsburg. Kramer's mother, Cecilia, was also artistic being a trained singer who was well known for touring a regional network of theatres established by her father, at which she performed traditional Slavic and Hebrew folk songs. Following the accession of Tsar Nicholas II in 1894 a new virulent anti-semitic policy was introduced to force Russian Jews either to assimilate or leave the country. The Kramers chose the latter, and left Russia in 1900, emigrating to England where they settled in the Northern industrial city of Leeds. Here they lived in poverty, with Max Kramer taking work as a photographer's assistant. 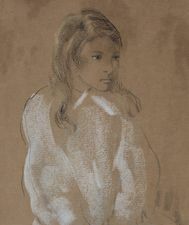 The Kramers had four more children born in Leeds, the oldest of whom, Sarah, later married the artist William Roberts. In 1902, aged only ten, Kramer ran away from his new home in Leeds, taking various jobs in different parts of the north of England, and even going away to sea for six months. During this sojourn away from his family, Kramer attended occasional art classes, but his first formal art education was at Leeds School of Art which he attend from 1907 till 1913. During this time he was also to become involved in the radical modernist organisation the Leeds Arts Club, which introduced him to the ideas of expressionist artists, such as Wassily Kandinsky and the spiritualist beliefs that came to underpin his work. Writing to his close friend and fellow Arts Club member Herbert Read in 1918, Kramer stated that when he looked at an object he saw both its physical appearance and its spiritual manifestation. His struggle, he claimed, was to escape the physical appearance and only paint the spiritual form. Such ideas came straight from the expressionist and Theosophical spiritualism that dominated the Leeds Arts Club, and show clearly that Kramer was himself an English Expressionist artist. 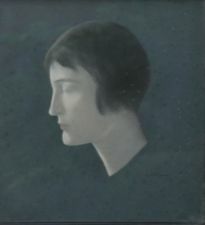 With a scholarship from the Jewish Educational Aid Society, Kramer was able to study at the Slade School of Art from 1913 to 1914. 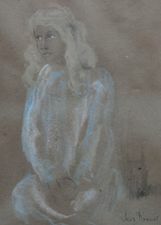 Here be befriended other leading artists of the day, including Augustus John, David Bomberg and William Roberts. He was involved in the Vorticist movement led by Roberts and Wyndham Lewis, although he was never really a follower of the style. Nonetheless, several of his woodcuts did appear in the Vorticist literary magazine Blast, and other periodicals including Colour, Rhythm and Art and Letters. In London, Kramer rapidly became well known in the hedonistic artistic circles that dominated before the First World War and was to be seen frequently at well-known artistic haunts, including the cabaret-club The vae of the Golden Calf, The Cafe Royal and The Tour Eiffel. In the early 1920s Kramer returned to Leeds where he became something of a local artistic celebrity. After the collapse of the Leeds Arts Club in 1923 he had numerous schemes to establish a new artistic meeting place in the city, almost all of which came to nothing. The great exception to this was the informal gathering called the Yorkshire Luncheon Club, which met regularly at Whitelock's public house in Leeds, and invited some of the leading cultural figures of the 1930s, 40s and 50s to Leeds to speak. For the most part, however, Kramer's return to Leeds was not a triumph, and he lived in utter poverty and alcoholism, often producing poor quality portraits of local figures to pay for his drinks. None of this later work does justice to the startling quality and originality of Kramer's earlier work, including paintings such as The Day of Atonement, The Talmudists, The Jew, Mother and Child, and the 1922 abstract expressionist painting Musical Theme. His friend Jacob Epstein made a bust of him, copies of which can be found in the Tate in London and at Leeds City Art Gallery. The Tate, the Victoria & Albert Museum and the British Museum all hold examples of Kramer's work, but the most extensive collections can be found in Leeds at the Leeds City Art Gallery and Leeds University Art Gallery. The standard work on the artist is now David Manson, Jacob Kramer: Creativity and Loss (Bristol: Sansom, 2006).